If I had a penny for every time I hear the phrase, we’d own a resort on our own private island. “You’ve got your hands full!” Is everyone’s instinctive reaction to a mom of multiple kids, from parents and childless people alike, and it elicits sighs from a lot of twin moms because we hear it so much. But I’ll let you in on a secret: I kind of like it. For one thing, I love having my hands full of these babies. It’s not like having an armload of laundry or groceries. They’re living souls with more curiosity, energy and silly noises than I could imagine. It’s like saying, “Wow, you’ve got your hands full of chocolate!” Um, yeah, jealous? For another thing, the phrase either makes me feel like maybe I’m starting to get this mom thing together, if the person says it with an affirming smile; or it reminds me I’m not doing this alone, if the person opens the door for me because they can see I’m about to spill my diaper bag’s contents everywhere. When I don’t have it together, I feel like I’m just a public representation of a home reality for all moms– my crazy is just more visible than it may be for singleton moms! “So, what do you do all day? Oh, oh, I see.” Yes. Now hand me the mop, please. It’s possible to take the babies on errands, have a picnic, take a walk at the park. It’s possible to do more than survive– I want people on the fence about kids to see that you can be a mom and thrive. Of course, I often walk around in public in “play clothes” and a messy bun, with peanut butter on my shirt. That comes with the territory. But this phase will pass, and I want to love each phase we’re in, messy or not. Hearing “You’ve got your hands full!” also makes me laugh, because I almost never do. 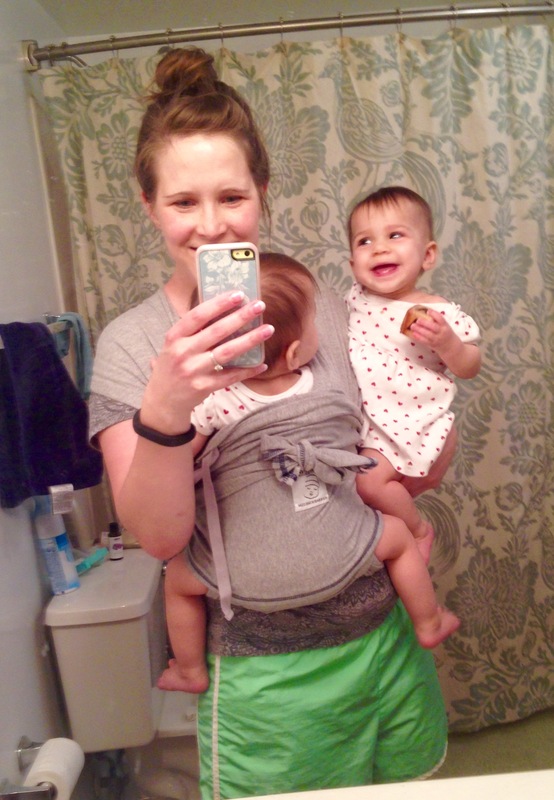 When I was pregnant with the girls, my most burning question was, “But how do I hold two babies?! What if they’re both crying?” And in the beginning, that was really tough. You just deal. Sometimes one just cries for a minute. But we’ve entered this sweet spot where the girls are old enough to sit on my hip or in a shopping cart, and small enough to wear in the Ergo or K’Tan carrier, so I am usually wearing a baby and carrying or pushing a baby. There’s a hand free for coffee, y’all. And someday, another baby. The next time you see a mom and you want to say, “You’ve got your hands full,” go ahead. But say it with a smile, and maybe open the door for her. And tell her that her armload is pretty wonderful. You are an awesome momma, don’t you forget it! So happy to hear you facing every adventure with an open mind! Love love those kiddos! Keep up the great work! God gave you all the tools you need! I love the part about being an ambassador for motherhood. I think of that too… of course I’m not “put together” every single day, but you know, a lot of the time this is pretty great and I want other people to know it!